Our earth has abundant water on its surface. This water is in form of oceans, rivers, lakes, and glaciers. But, the only small percentage of water is freshwater that we drink and use. The rest of the water lies in oceans which is very salty. Have you ever thought, how this freshwater reaches us? We get this freshwater in a cyclic process called water cycle. The water cycle is a continuous process that happens all the time around the earth. This process is very crucial in delivering the water from oceans to lands, and back again. For example, the water you see in the rivers, lakes, and glaciers is available to us due to the water cycle. There are various methods through which the water circulates around the earth. Some methods bring the water from land to the atmosphere and form clouds. While other methods bring water back to ground on various places. This way the water is distributed across the whole planet. Water moves to the atmosphere in form of vapors (gaseous state) from all around the earth – leaving behind all the salts and other impurities. There are 3 main methods that can transport water from land to atmosphere. This is the most important method than other two. This method is responsible for 90% of the water vapors that are produced around the earth. 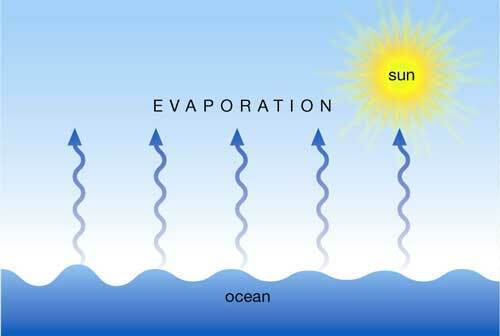 Evaporation happens at the surface of the water – where atmosphere touches it. As the air moves above the surface of the water, it takes away the some of the water with them as vapors. The hot water evaporates quicker than the cold water. Our sun provides heat energy all the time to earth. When sunlight reaches oceans, lakes, and rivers, it raises their temperature and speed-up the evaporation. The major portion of the water in the atmosphere comes from oceans. These oceans cover 71% of the earth’s surface. All the freshwater – that we get – is indirectly taken from oceans. This method only works with ice or snow. Sublimation is a process in which the ice is directly converted into vapors (gaseous state) – without moving through the liquid The sublimation process is favored by cold temperature and high wind speed with sunlight. It is similar to evaporation. But instead of groundwater, evaporation happens on the leaves of plants. Plants release a lot of water on their leaves – due to some cellular processes. This water is then evaporated into the atmosphere. Now the water has been transported into the atmosphere by various methods. But, how this water come back to the land and moves across it? Let’s discuss them. This is the process in which water vapors that escaped from the land, come back. It happens due to condensation of the water vapors. When vapors rise above the land, they form clouds. Vapors start to condense in the clouds and form the tiny droplets. These tiny droplets attach to each other and form big These big droplets are heavy enough to fall back on the land – which is also called raining. Precipitation is not always in form of rain, but it is also in form of snow, sleet, and hail – depending on the weather of the region. 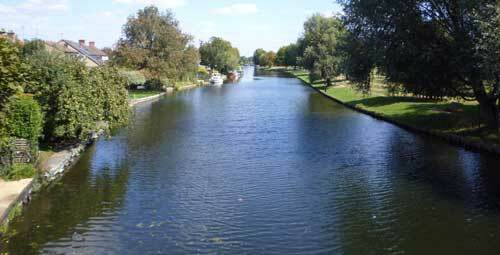 Rivers play the main role in distributing the water across the land. The precipitation on mountains and melt-down of glaciers gather very large amount of freshwater. This freshwater flows down the high altitude regions towards low altitude region through a path. People usually carry and store the needed water, and rest of the water flows down towards oceans. 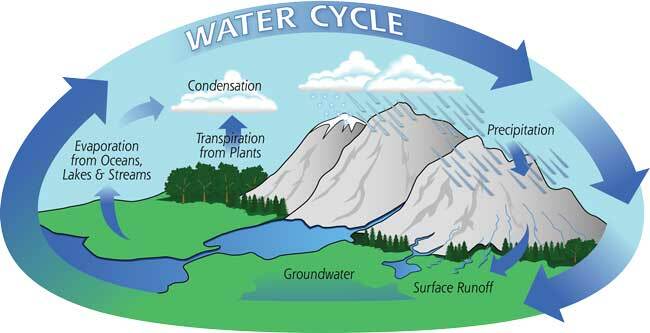 This is also an important part of the water cycle in which water is stored naturally. The stored fresh water is in form of glaciers, snow caps. This water is stored on top of mountains – where the temperature is low. Precipitation also occurs on these high mountains, but due to low temperature, the water is in solid form (ice). When the temperature of these regions increases – due to weather – we get the liquid water flowing in the rivers. So far, we have discussed the water cycle technically. But it is necessary to discuss its importance in everyday life. All the humans, animals, and plants around the earth have access to fresh water – that’s why we are alive. For example, we humans get the water from rivers, ground, or direct precipitation. All the plants in the jungle need periodic precipitation to stay alive. Animals need ponds or lakes for drinking water. These all the things are possible only due to the natural water cycle. Today, human-caused activities have caused very adverse effects on the natural water cycle. The most harmful activity that humans are causing is carbon emission – that is a greenhouse gas. Carbon emission cause global warming. As a result, the average temperature of the earth is rising, and glaciers are melting at a higher rate than they are forming. It will cause water shortages in near future. The disturbance in water cycle is so severe that many regions have no precipitation at all – that used to have regular precipitation. While some regions have more than normal precipitation, causing floods. The second disastrous effect is caused by pollution. Pollution of land, water, and atmosphere increase the toxicity of fresh water. As a result, the health and life of animals, marine, plants, and even humans have damaged severely. It is estimated that transpiration accounts for 10% of the vapors in the atmosphere. Underground water resources are called aquifers. These aquifers are replenished by water cycle. The water in aquifers can remain there for thousands of years – sometimes millions of years. 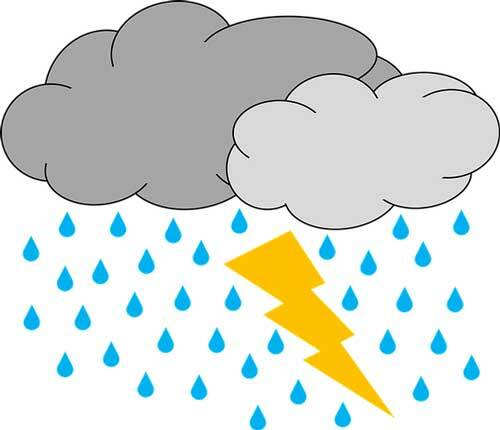 Clouds may contain water in all three states (solid, liquid, and gas) at the same time. The water that earth got at the time of its formation is the same water that you drink today – even dinosaurs drank that water too. Our earth has only 3% freshwater, from which only 30% is in the liquid state – the rest of the fresh water is in glaciers and ice caps. 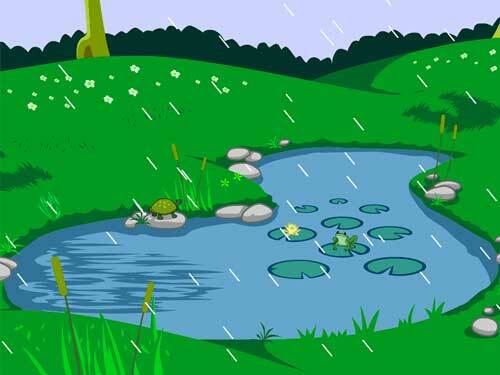 Abdul Wahab, "Water Cycle," in Science4Fun, April 13, 2019, http://science4fun.info/water-cycle/.